Liam M Flood, Guy Kenyon,	The Journal of Laryngology & Otology, Volume 126 Issue 12, pp 1195-1199. R Aggarwal, K M J Green,	The Journal of Laryngology & Otology, Volume 126 Issue 12, pp 1200-1203. Mastoid subperiosteal abscess in children: drainage or mastoidectomy? I Psarommatis, P Giannakopoulos, E Theodorou, C Voudouris, C Carabinos, M Tsakanikos,	The Journal of Laryngology & Otology, Volume 126 Issue 12, pp 1204-1208. P D B West, Z A Sheppard, E V King,	The Journal of Laryngology & Otology, Volume 126 Issue 12, pp 1209-1215. E Lesinskas, V Stankeviciute, M Petrulionis,	The Journal of Laryngology & Otology, Volume 126 Issue 12, pp 1216-1223. L Masterson, E Agalato, C Pearson,	The Journal of Laryngology & Otology, Volume 126 Issue 12, pp 1224-1230. A N Kassab, M Rifaat, Y Madian,	The Journal of Laryngology & Otology, Volume 126 Issue 12, pp 1231-1237. Reversible nasal airway obstruction: does change in nasal peak inspiratory flow following decongestion predict response to topical steroids in chronic rhinosinusitis patients? N K F Koo Ng, D Young, G W McGarry,	The Journal of Laryngology & Otology, Volume 126 Issue 12, pp 1238-1240. R Mandavia, V Dhar, K Kapoor, A Rachmanidou,	The Journal of Laryngology & Otology, Volume 126 Issue 12, pp 1241-1246. A Rafferty, D Knight, S Bew, L Knight,	The Journal of Laryngology & Otology, Volume 126 Issue 12, pp 1247-1253. P Capaccio, P E Sigismund, N Luca, P Marchisio, L Pignataro,	The Journal of Laryngology & Otology, Volume 126 Issue 12, pp 1254-1260. V H Schartinger, C Falkeis, K Laimer, G M Sprinzl, H Riechelmann, M Rasse, I Virgolini, J Dudás,	The Journal of Laryngology & Otology, Volume 126 Issue 12, pp 1261-1270. S P Kanotra, D B Kuriloff, J Lesser, F Rest-Flarer,	The Journal of Laryngology & Otology, Volume 126 Issue 12, pp 1271-1273. A A Alsanosi,	The Journal of Laryngology & Otology, Volume 126 Issue 12, pp 1274-1275. A R Kakeri, A H Patel,	The Journal of Laryngology & Otology, Volume 126 Issue 12, pp 1276-1277. N Grover, F Amen, A Gallimore, G Brookes,	The Journal of Laryngology & Otology, Volume 126 Issue 12, pp 1278-1280. H Jones, A Trinidade, M C Jaberoo, M Lyons,	The Journal of Laryngology & Otology, Volume 126 Issue 12, pp 1281-1283. I P Tang, S Singh, G Krishnan, L M Looi,	The Journal of Laryngology & Otology, Volume 126 Issue 12, pp 1284-1286. 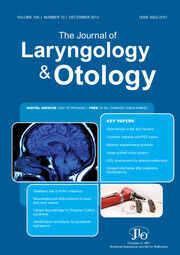 Tingwei Bao, Huiming Wang, Dong Wei, Di Yu,	The Journal of Laryngology & Otology, Volume 126 Issue 12, pp 1287-1291. A Muddaiah, A Banigo, F Galli, M A Latif,	The Journal of Laryngology & Otology, Volume 126 Issue 12, pp 1292-1295. V Sankar, M Shakeel, S Keh, K W Ah-See,	The Journal of Laryngology & Otology, Volume 126 Issue 12, pp 1296-1298. A Qureishi, A Lamyman, P Silva, G Cox,	The Journal of Laryngology & Otology, Volume 126 Issue 12, pp 1299-1301. C Vaughan, S J Prowse, L C Knight,	The Journal of Laryngology & Otology, Volume 126 Issue 12, pp 1302-1304.